George is a CERTIFIED FINANCIAL PLANNER ™ and Accredited Tax Preparer. George was the founder and owner of Financial Strategies Group, Inc prior to joining Personal Wealth Partners in May of 2016. In addition to over 30 years of experience in the financial services industry, he has also been preparing federal and state income tax returns for over 27 years. George’s commitment to each client is built upon values such as honesty, integrity, hard work and a strong sense of personal dedication. He strives to deliver service that is rooted in expertise and experience and delivered in an atmosphere of care. He works to help his clients better understand, manage, and use their collective financial resources to pursue what is important to them in their lives, and the lives of others they care most about. His end goal for each client is that they have a greater sense of understanding, control, and confidence that each facet of their financial affairs is well-coordinated and optimized. 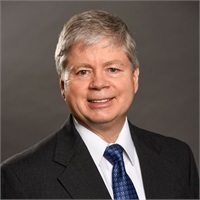 George graduated from the University of Wisconsin-River Falls with a Bachelor of Science degree and has lived in the River Falls, Wisconsin area since 1975. George holds the FINRA/NASAA Series 7, 63 and 24 Licenses with LPL Financial. When not working at the office, George enjoys “working” on home and land improvement projects as well as traveling, hiking, hunting and fishing. In addition, he enjoys spending leisure time with his wife Cindy, daughter Megan, various other friends and, last but not least, his parents in Arcadia, WI. Tax Services are offered separately from LPL Financial.